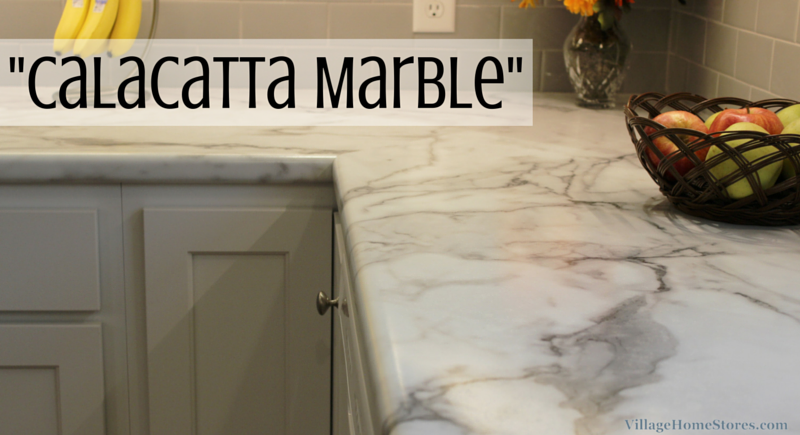 This Geneseo kitchen remodel has one of the best marble looks we have ever featured…. 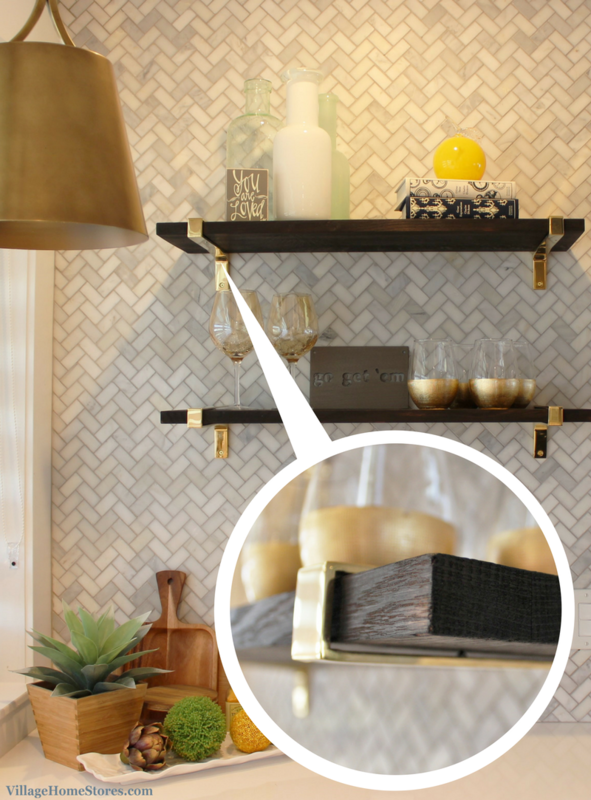 but these tops are Formica! 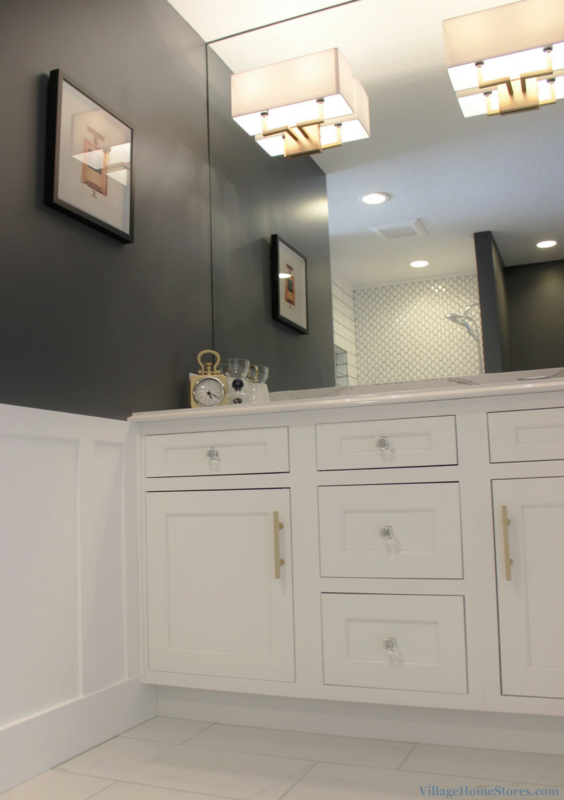 Paired with painted cabinetry, this project was a great before and after story to share on our TV show. 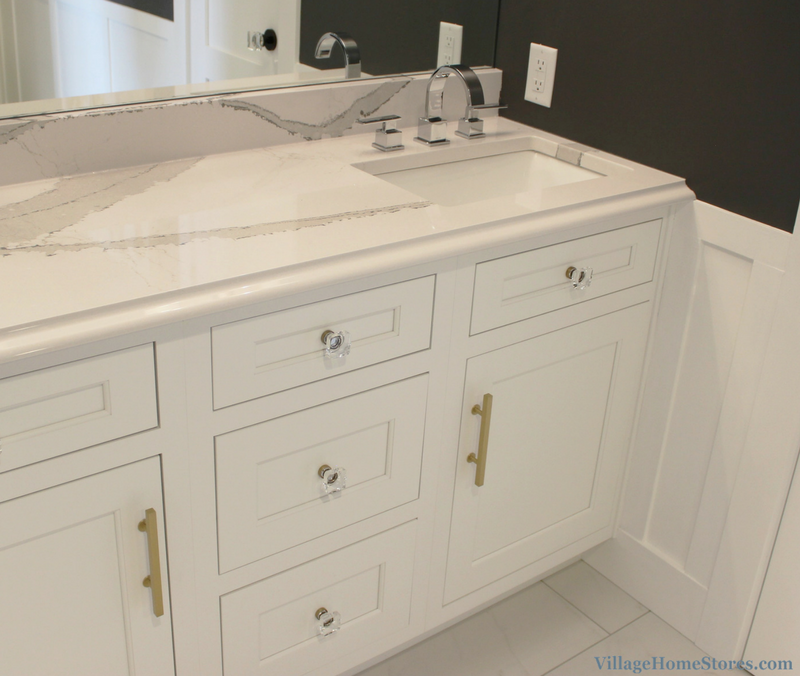 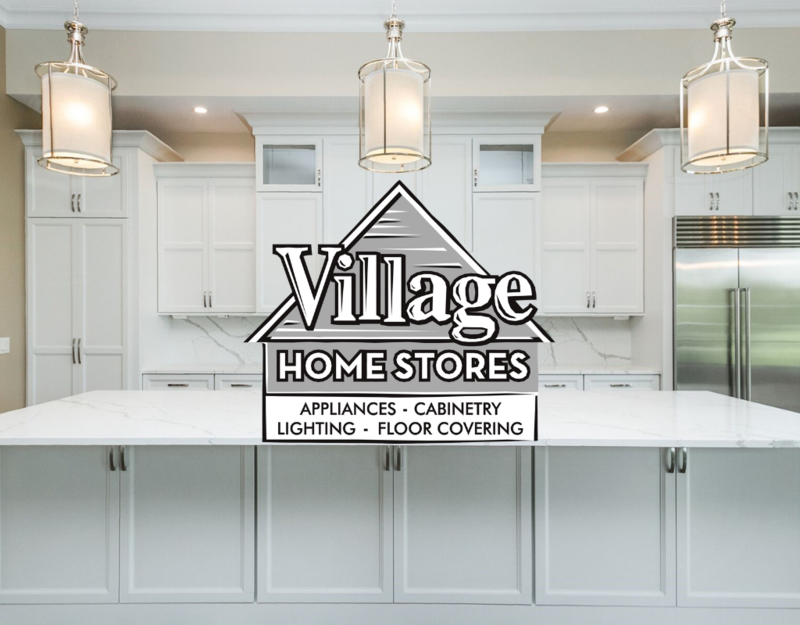 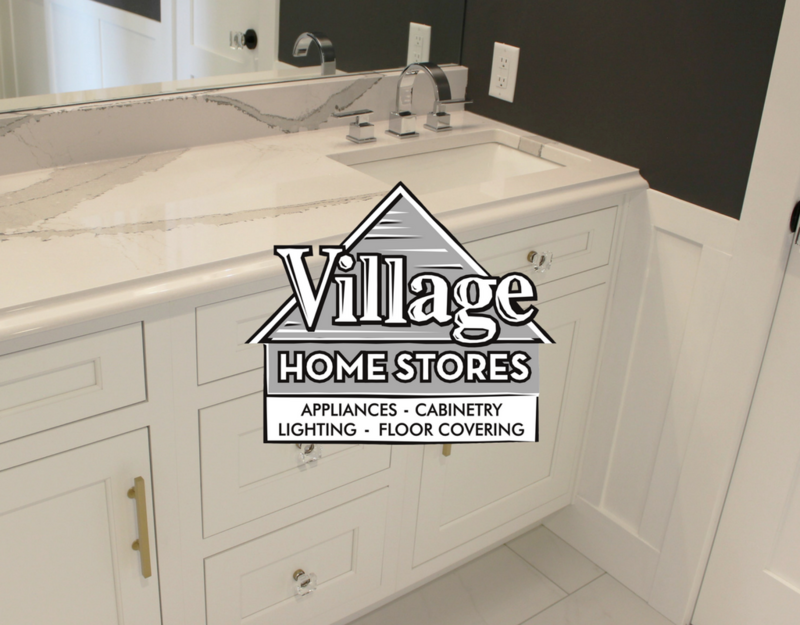 Watch a full episode of the Village Home Show including this Before & After story as well as a trip to our granite fabrication shop. 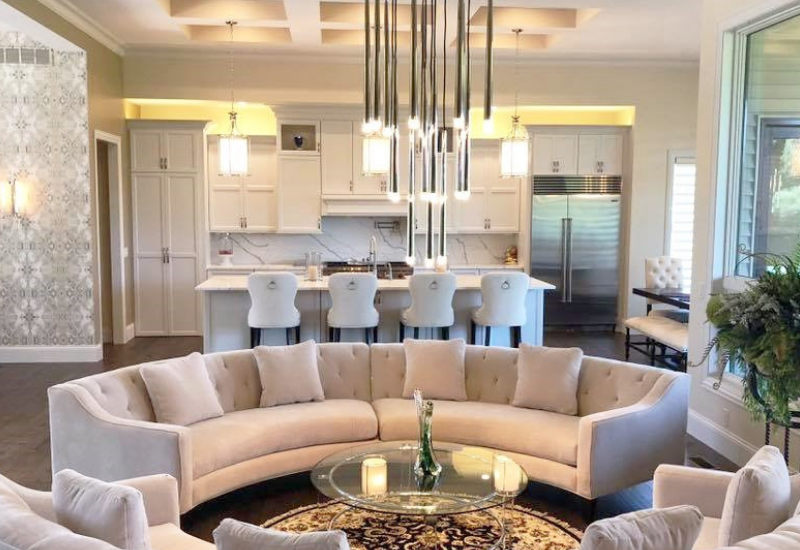 Click the video below to see the full tour. 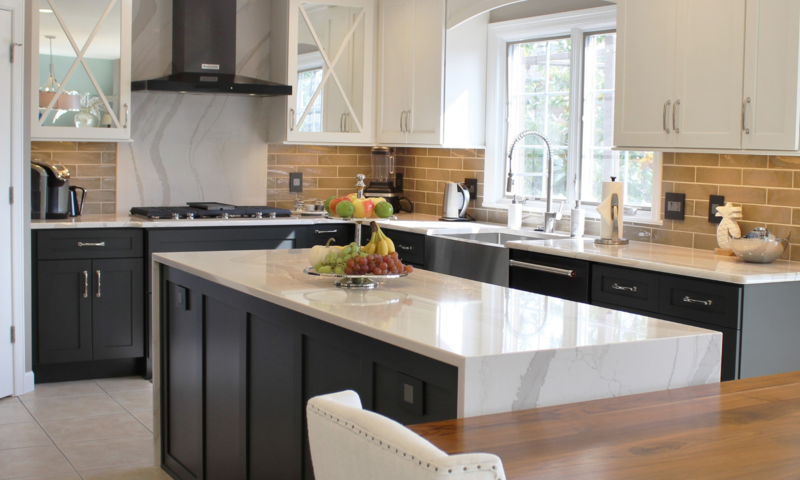 It is no secret that there is nothing more classic and timeless these days than a white painted kitchen. 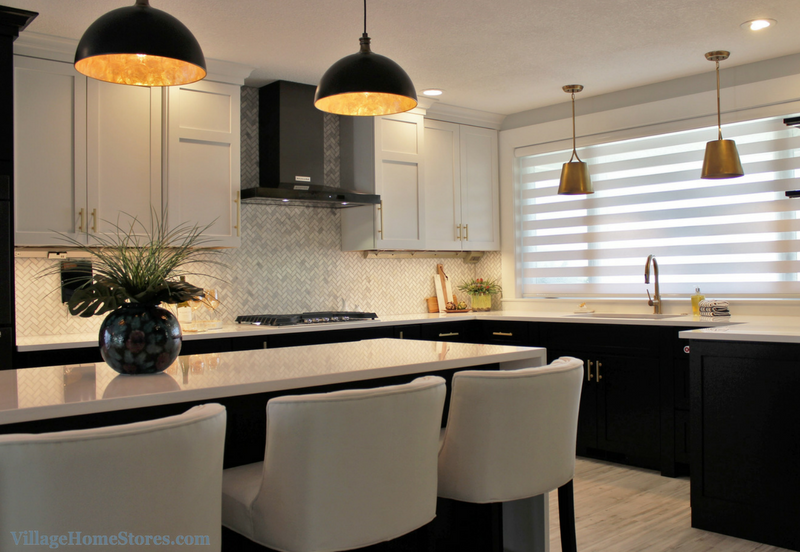 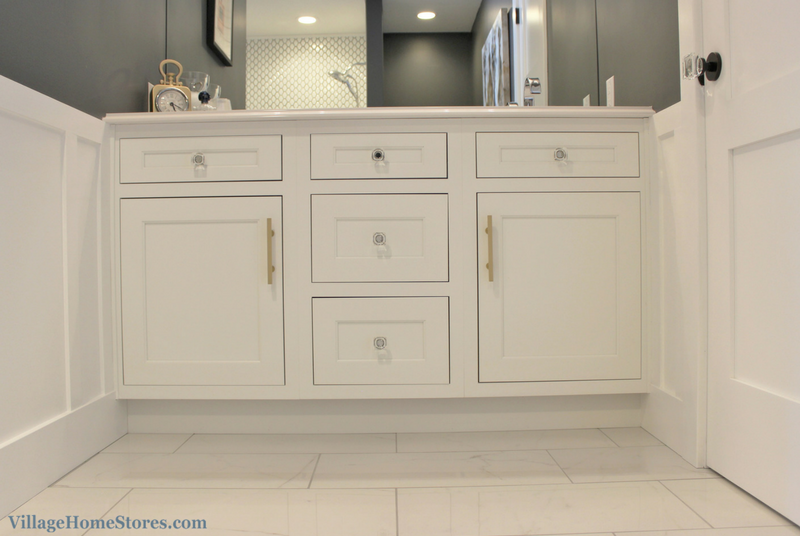 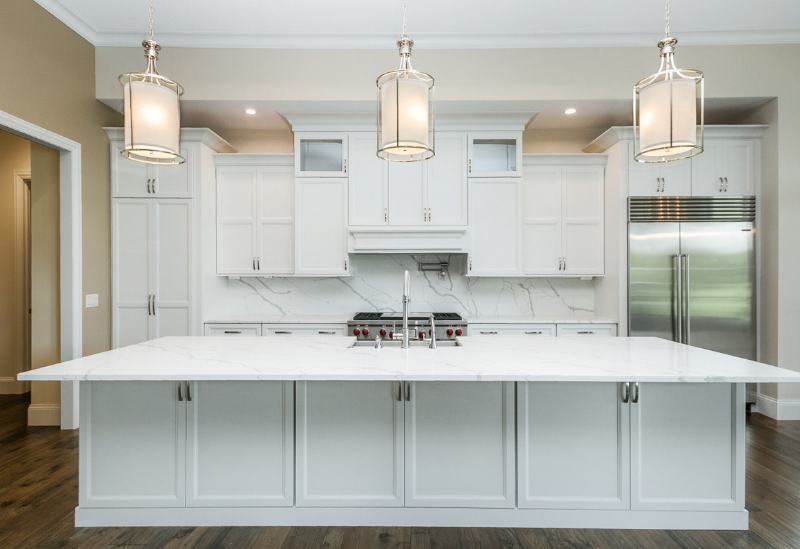 White painted cabinetry has been a universally popular choice for many years and will not be dropping in popularity within the next handful of years. 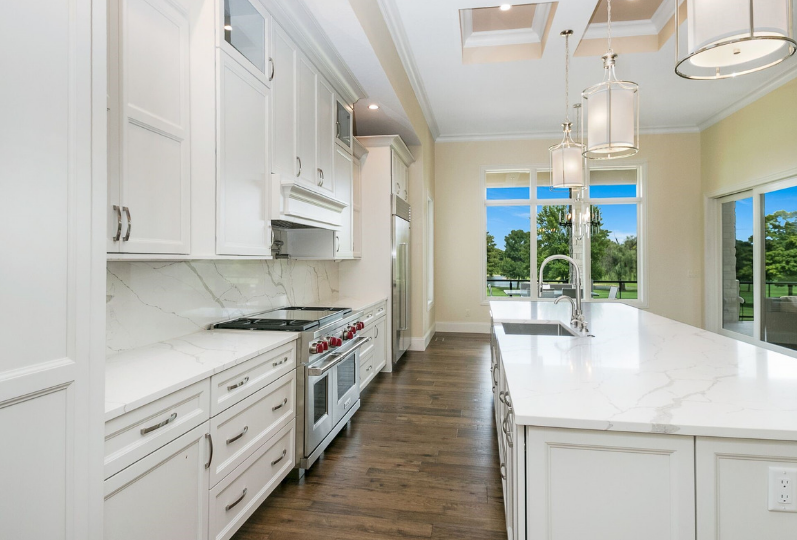 There is something about having a white kitchen that gives it a clean and classic look. 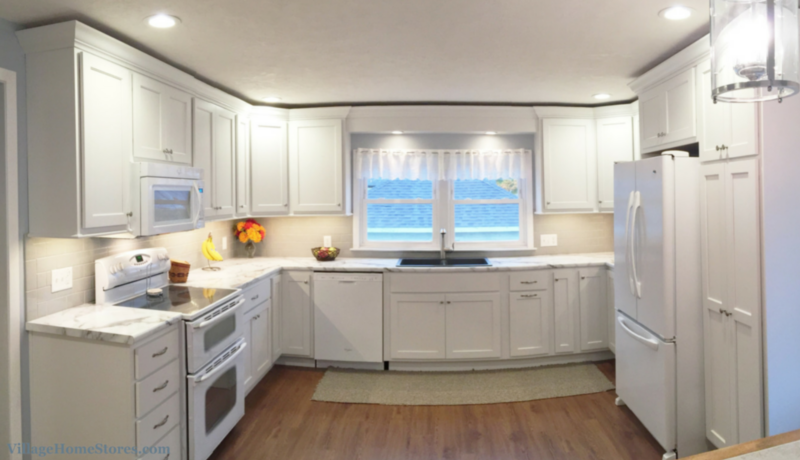 This newly remodeled kitchen in Geneseo, IL is no exception. 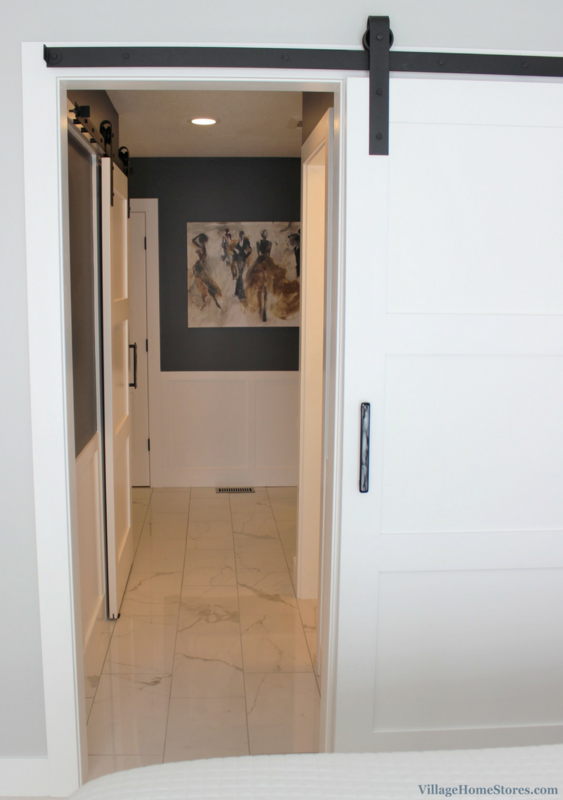 White painted cabinetry from our Koch Classic line has been installed in the “Prairie Shaker” door. 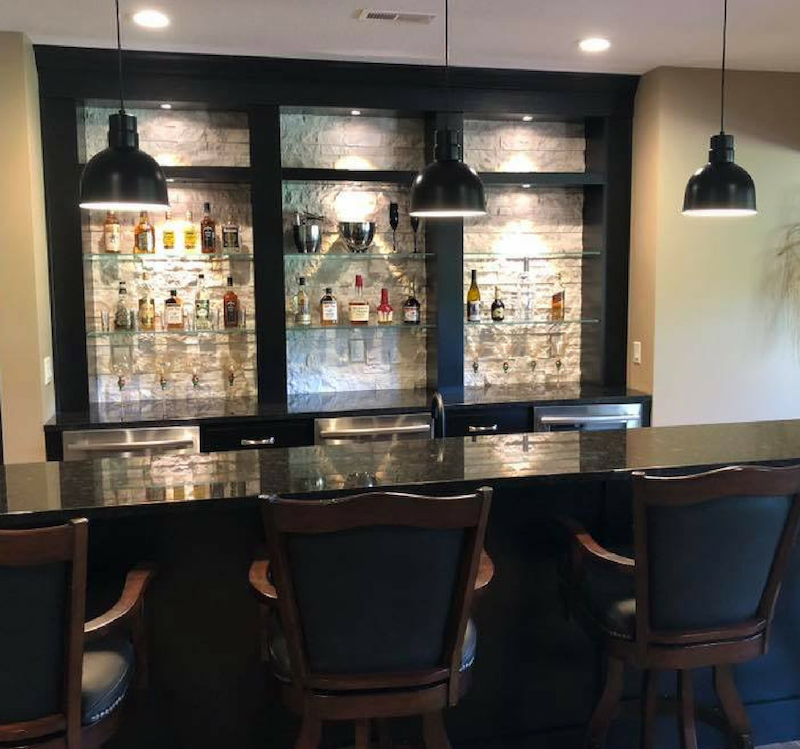 While there were no walls removed to create this finished space, we did have Durian Builders remove a ceiling soffit to help open up the space for extra cabinetry storage. 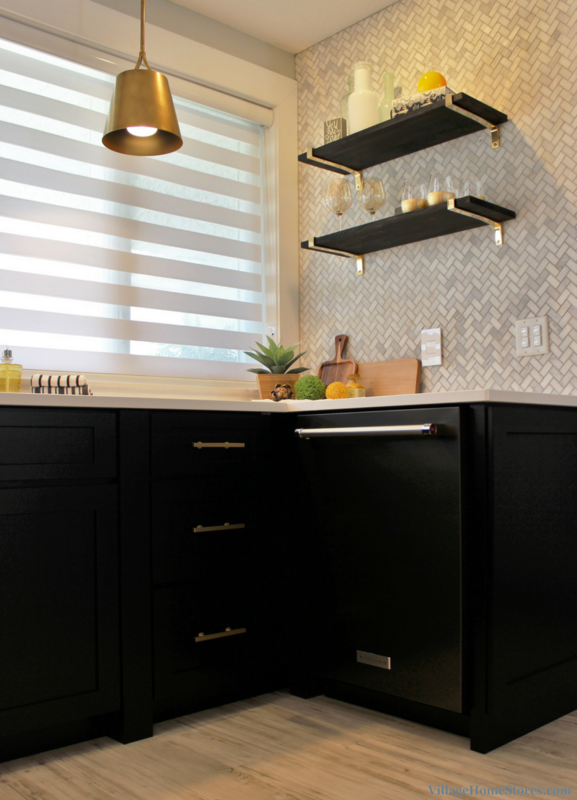 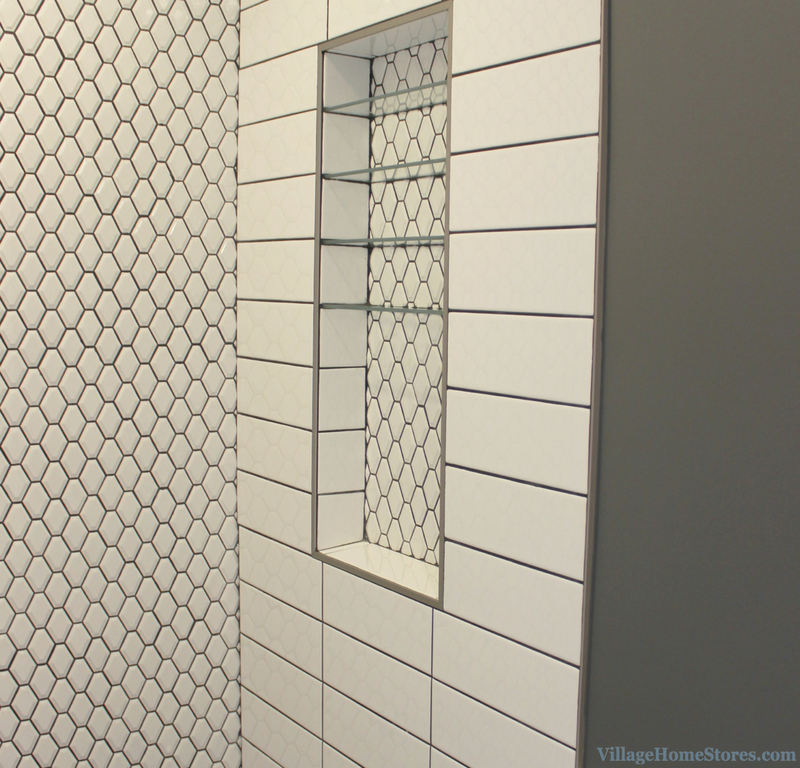 The original gold-flecked backsplash tile had been removed before we snapped this “before” photo. 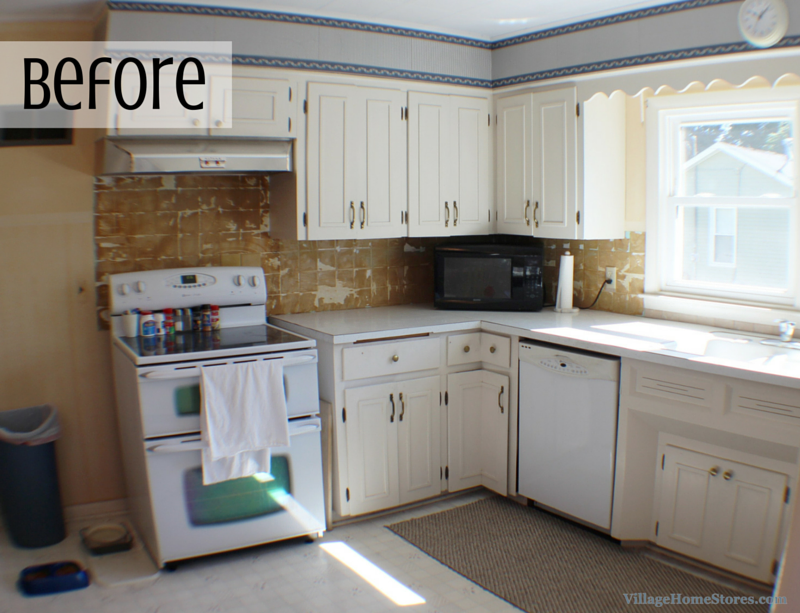 Even though the original kitchen was also white, it was in need of an upgrade. 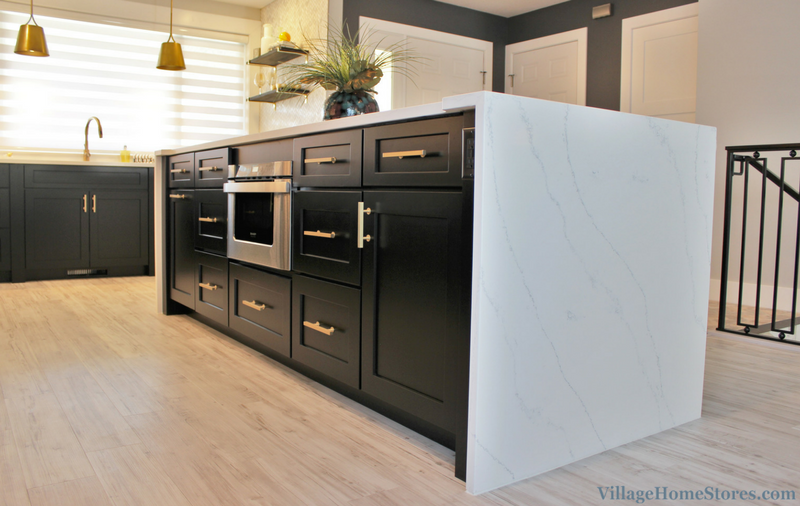 No changes were made to the general “footprint” of the new kitchen but new materials bring a great updated look to the space. 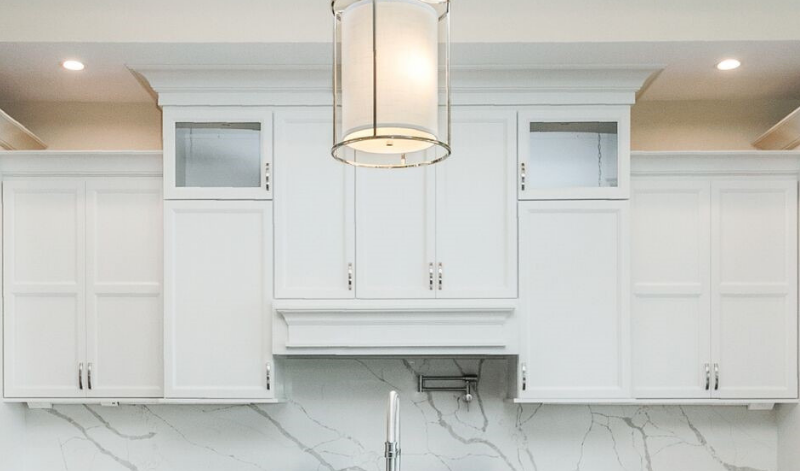 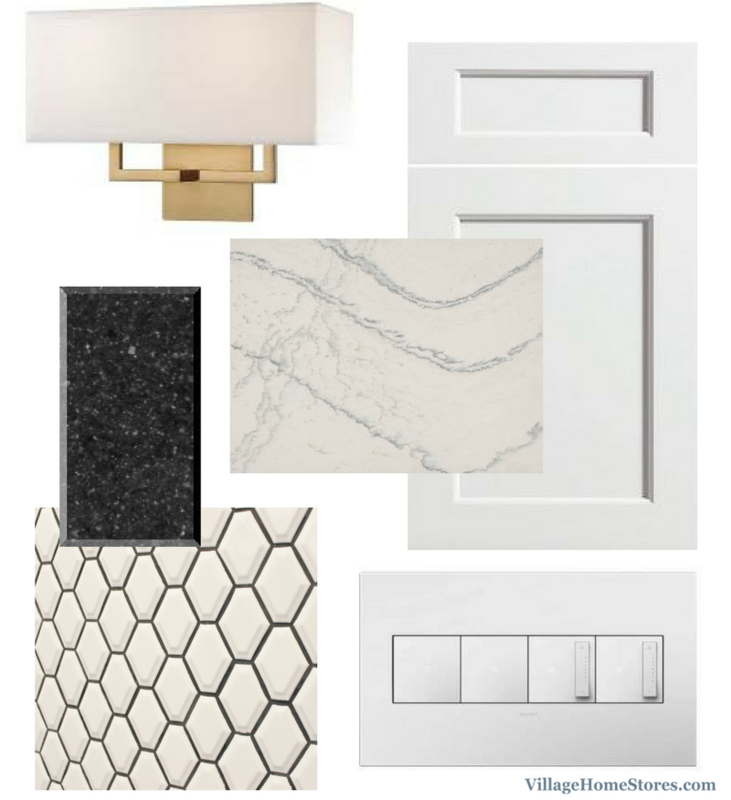 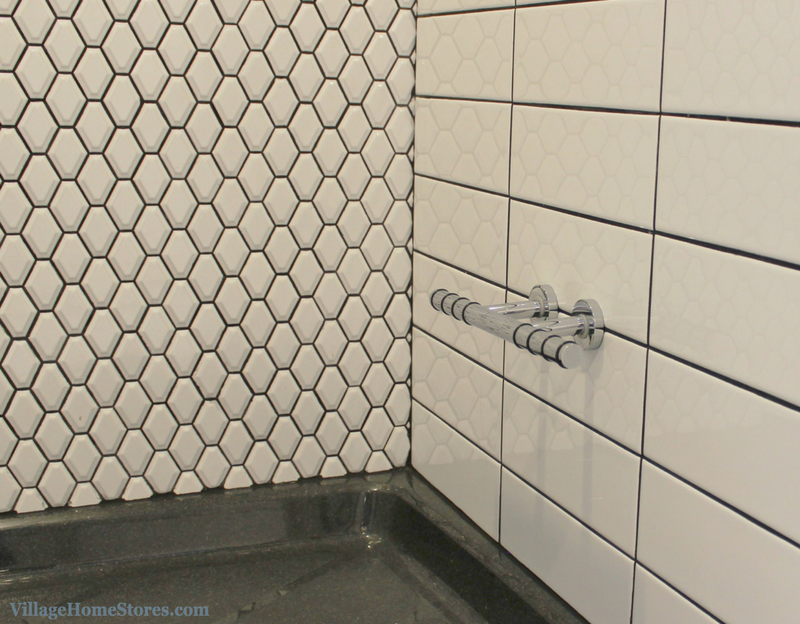 The clean and classic cabinetry is complimented by a subtle contrast in color in the Rittenhouse 3″ x 6″ subway tile that is picked up in the veining colors of the marble countertops….but these tops aren’t true marble! 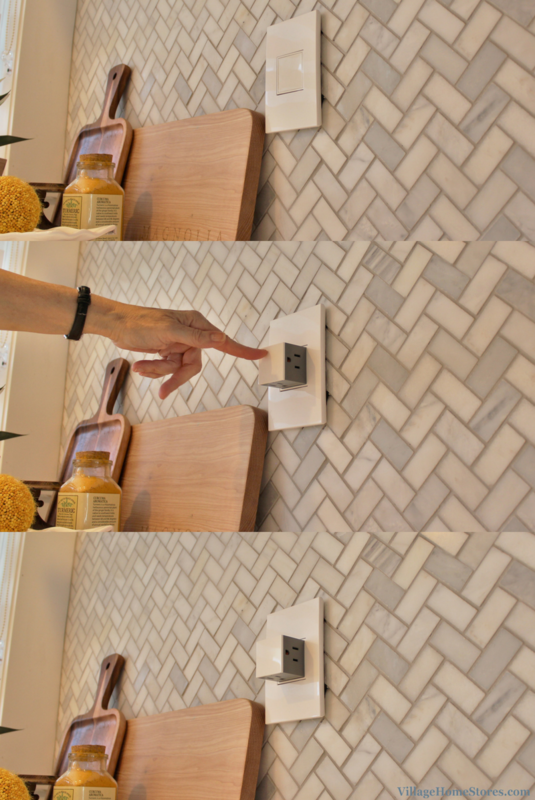 Don’t feel bad if these photos fooled you and you thought they were real (even in person this is easy to do). 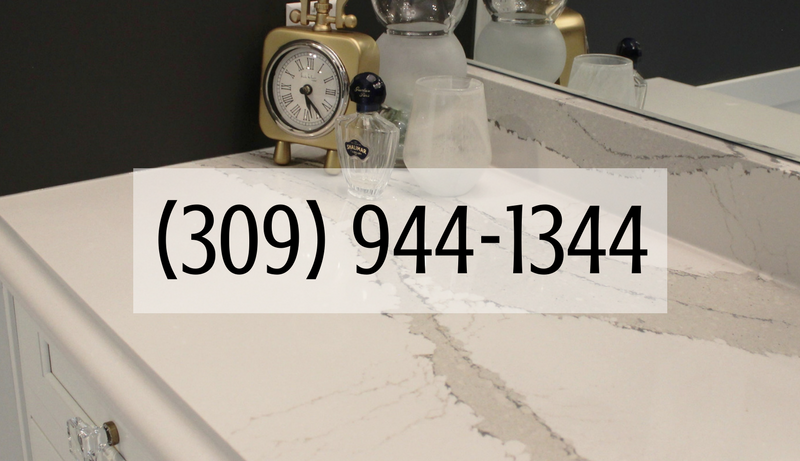 The countertops are a fraction of the cost of true marble because they are a Formica laminate color called “Calacatta Marble” Formica’s advancements in printing larger prints onto their sheetgoods helps create a very realistic look. 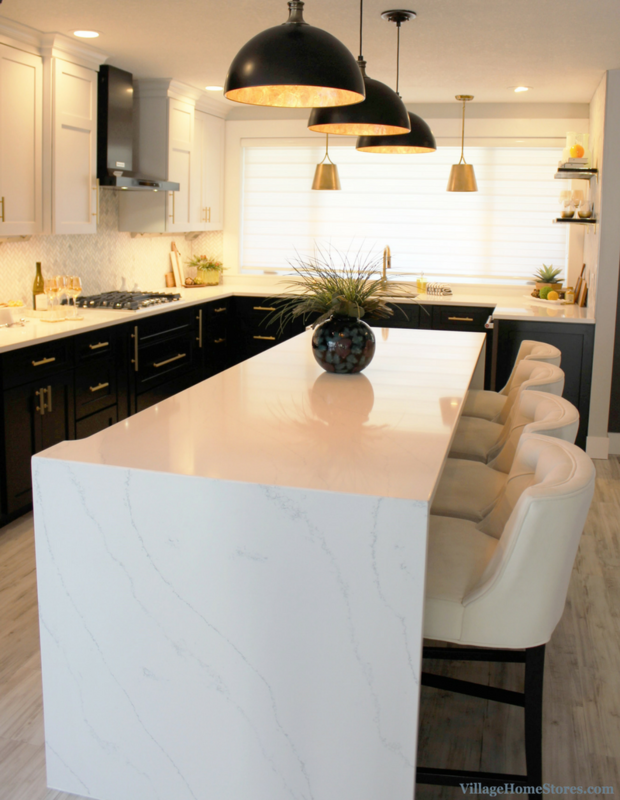 The original kitchen countertops had what is called a “Squared” edge profile. 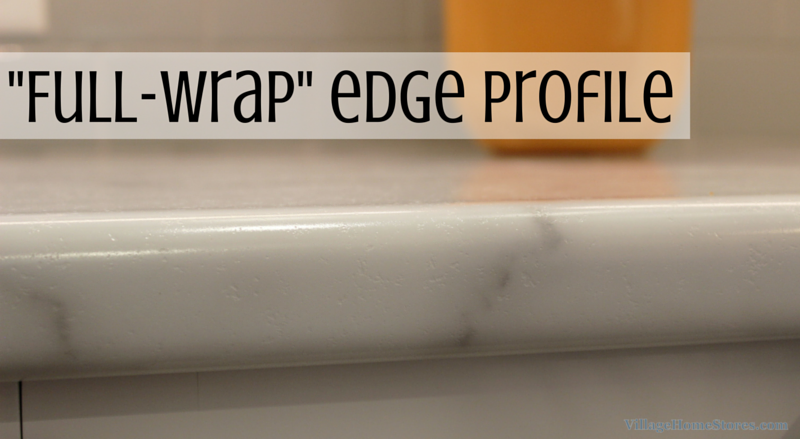 This means that you have two visible seams of material right on the front edge of the counters. 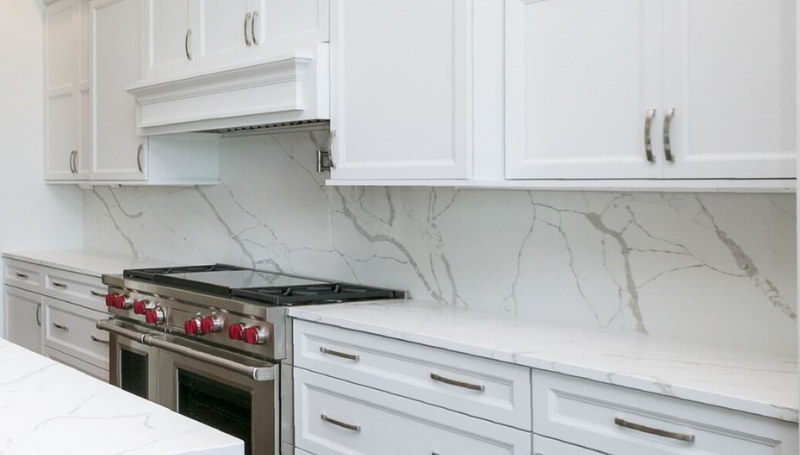 Installing these new Formica tops in the “Full-Wrap” edge profile helps to give a more convincing look of a slab of marble. 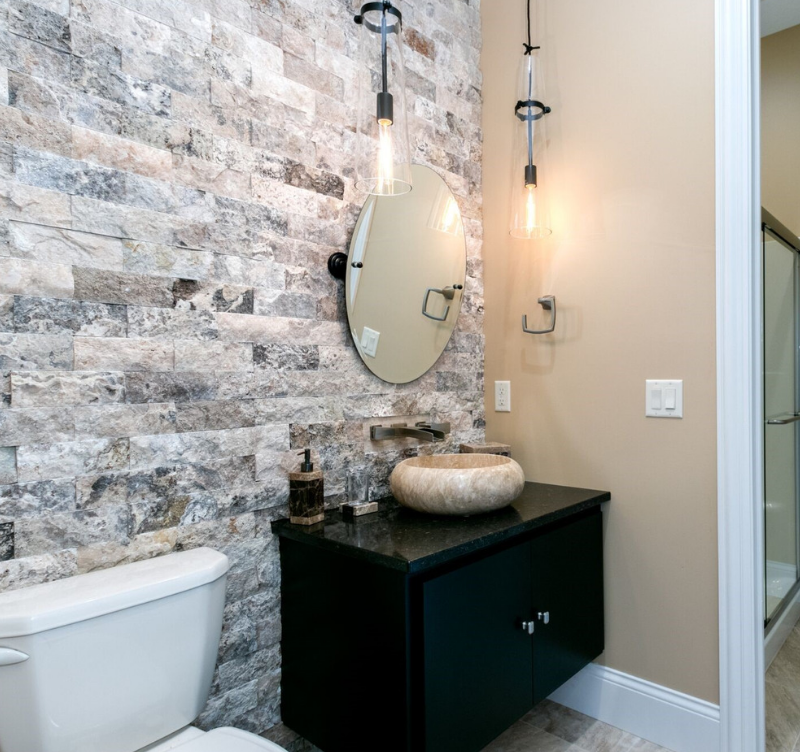 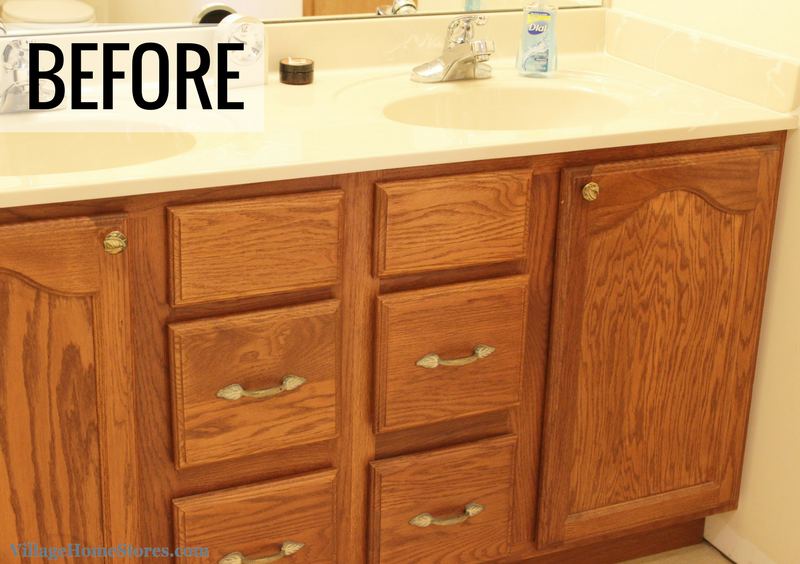 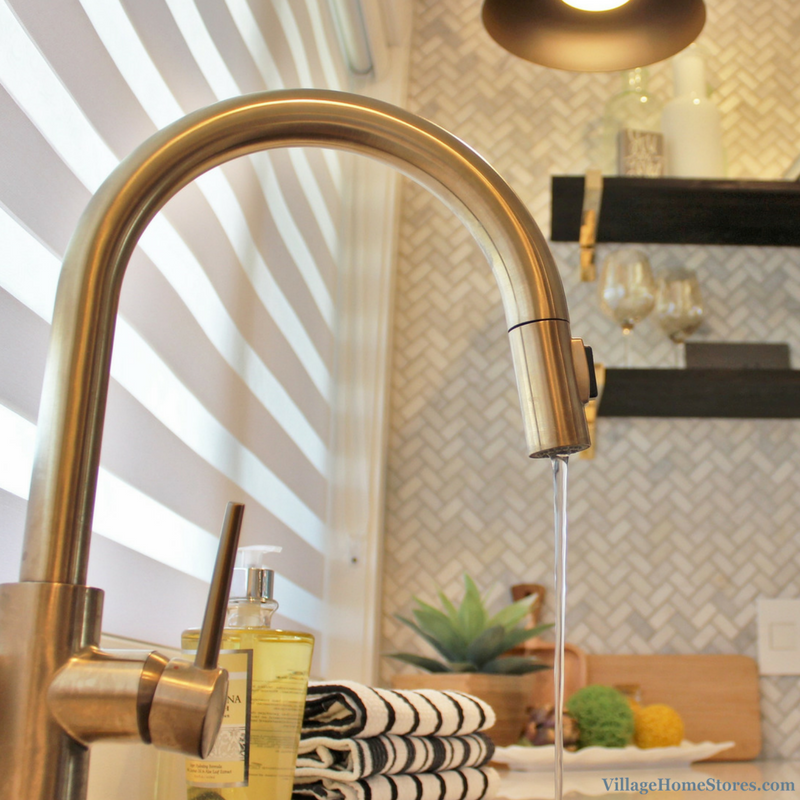 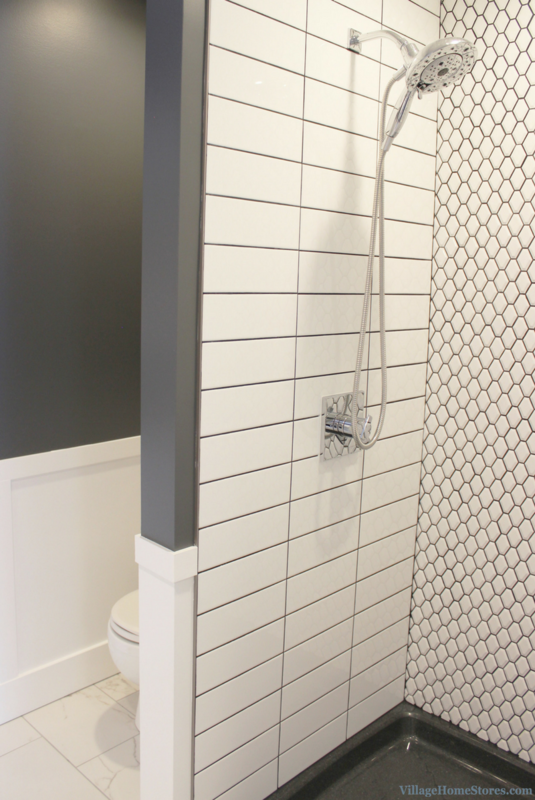 A drop-in sink and single-handle faucet complete the look. 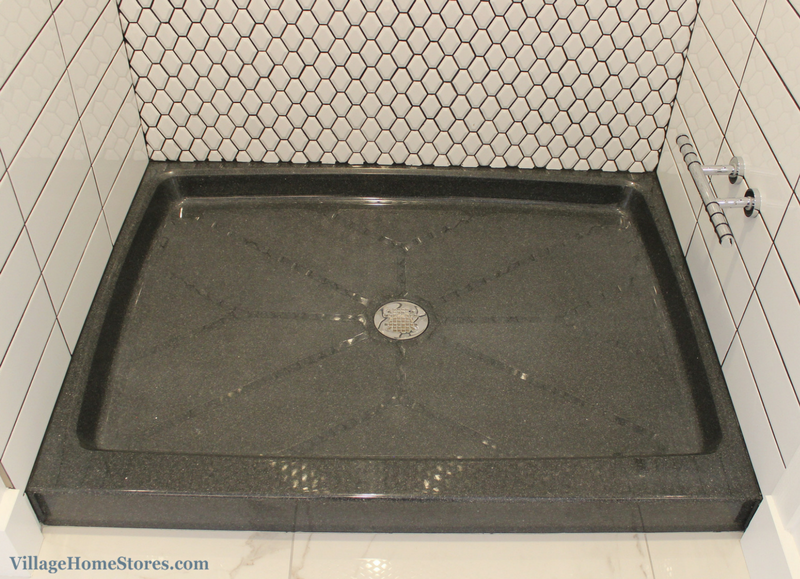 This E-Granite composite sink is durable and very stylish. 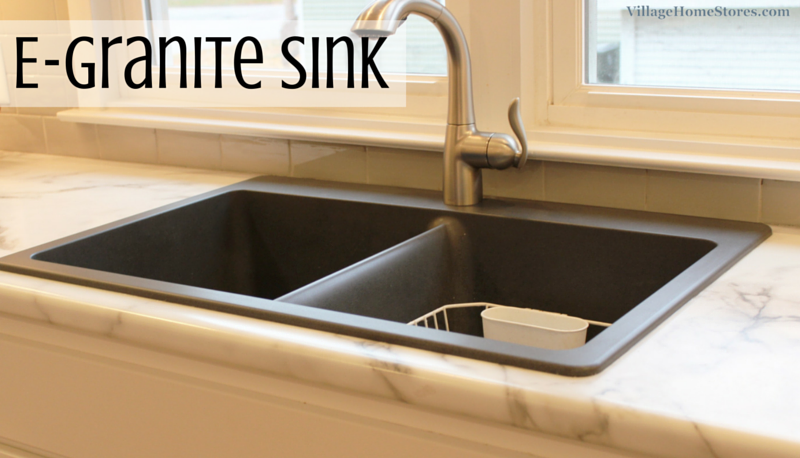 With five colors to select from and available in drop-in or under-mount styles, there is an E-Granite sink that is perfect for every counter choice. 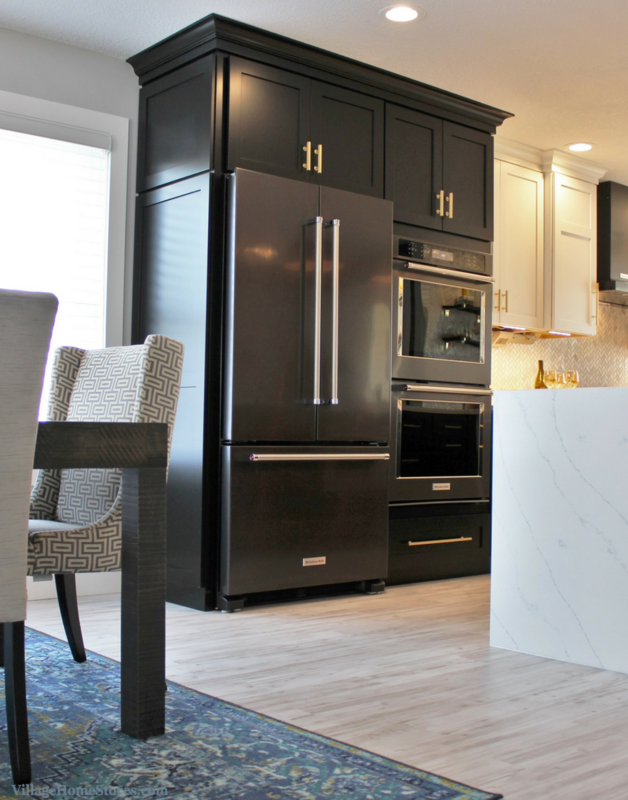 White appliances are right at home in this kitchen. 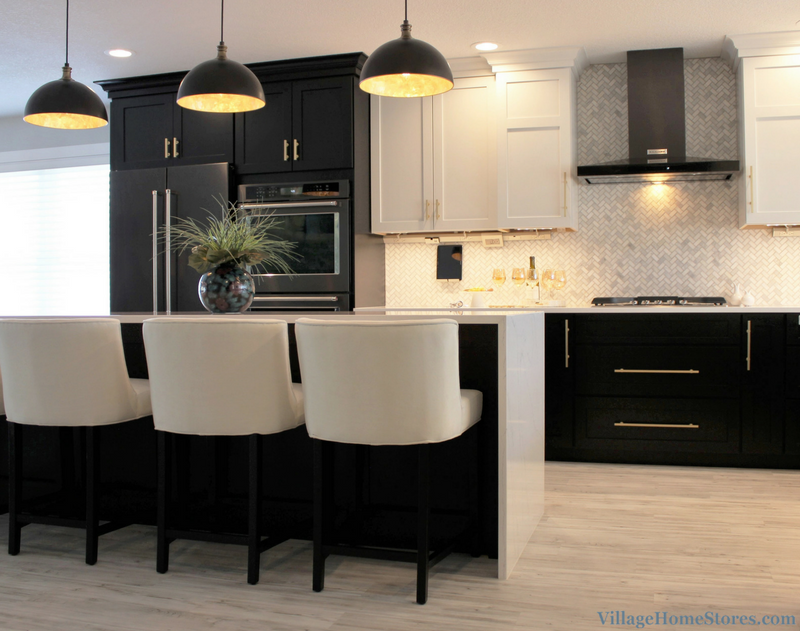 By not using Black or Stainless Steel appliances in this design, the U-shaped kitchen looks even larger and brighter. 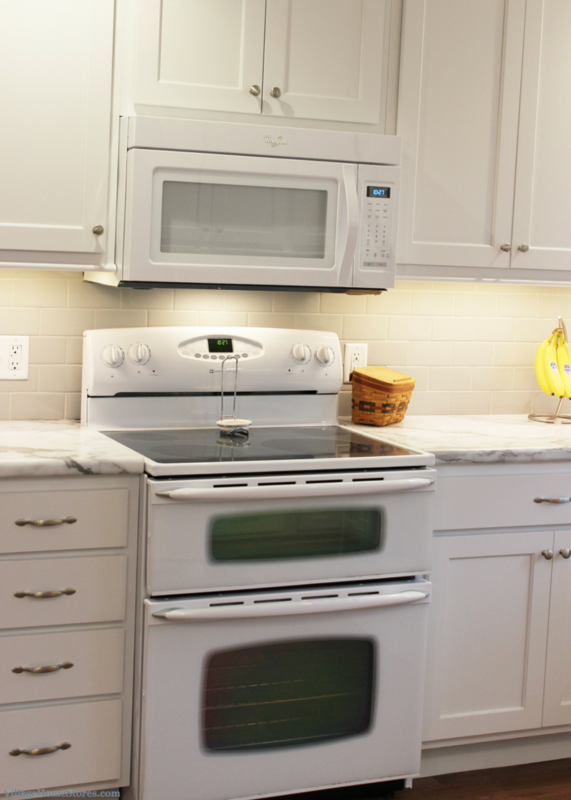 Installing a microwave hood above your cooktop helps free up counter space in the kitchen. 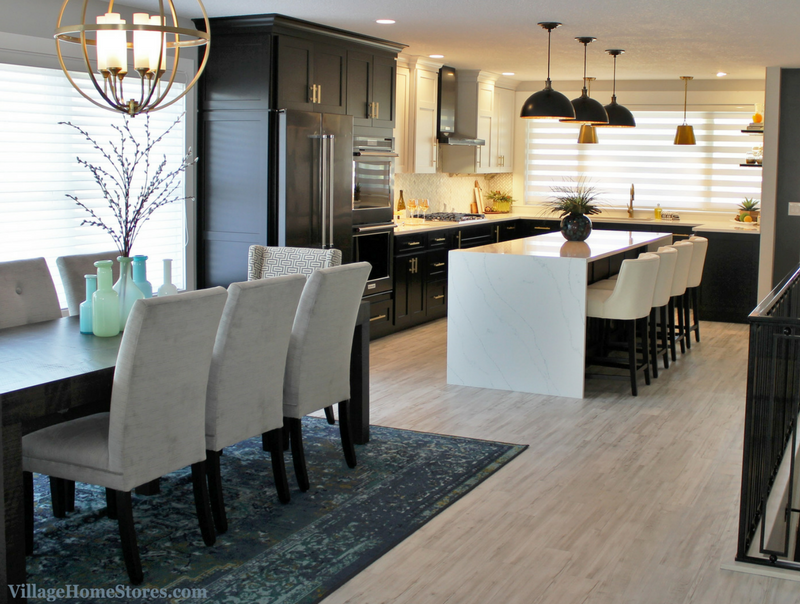 New flooring has been installed throughout this kitchen and eat-in dining area. 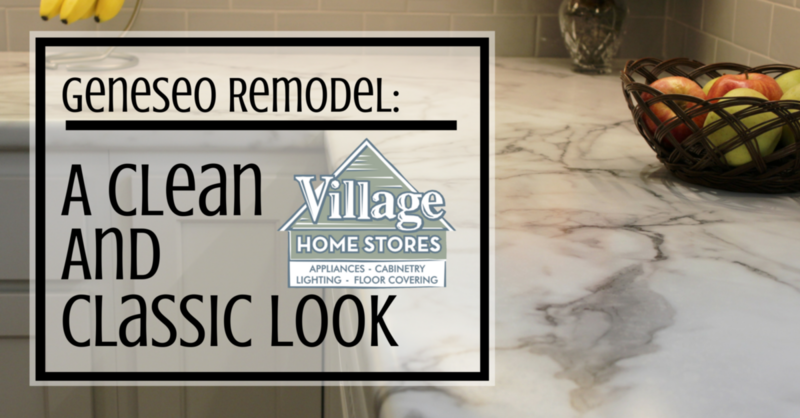 This “American Classic Plank” in the “Gunstock” color may look like hardwood… but it is in fact Luxury Vinyl Tile Planks. 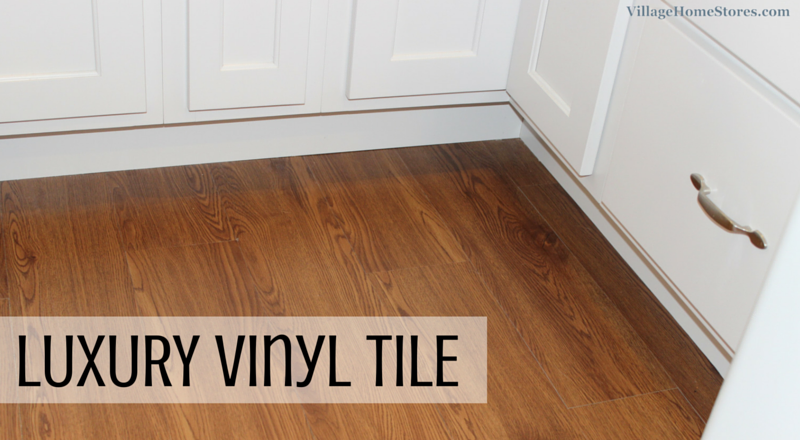 LVT flooring can be a wonderful choice for your kitchen because it far more comfortable to stand on for long periods of time when compared to ceramic tile or hardwoods. 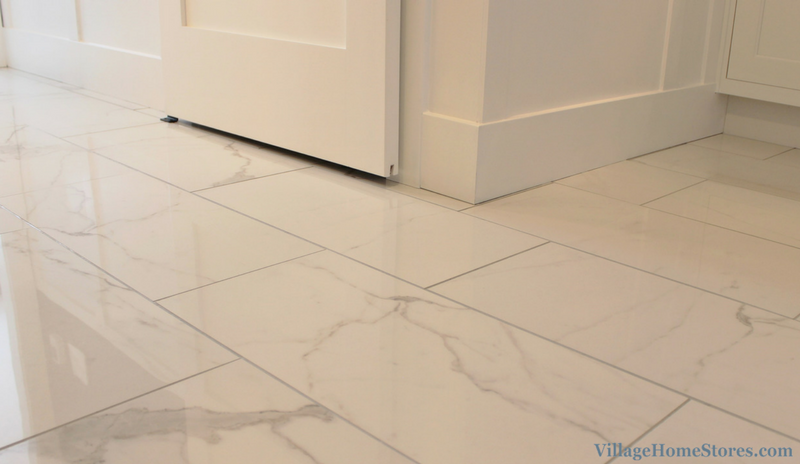 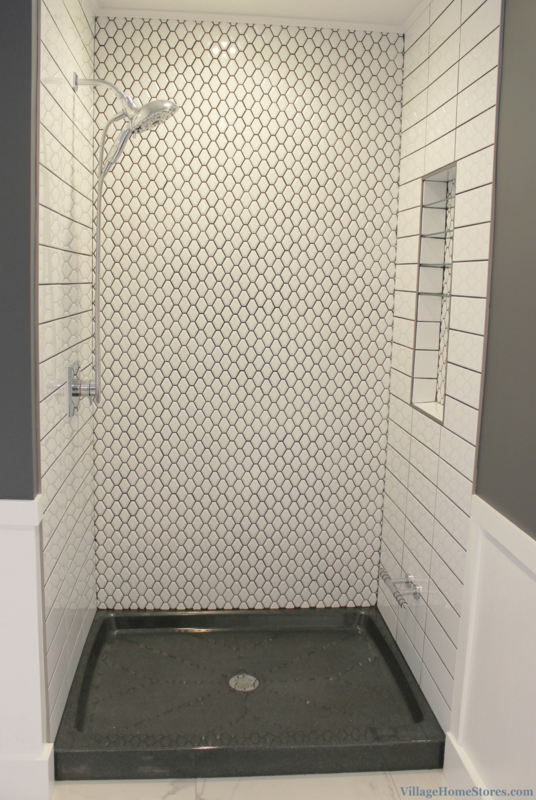 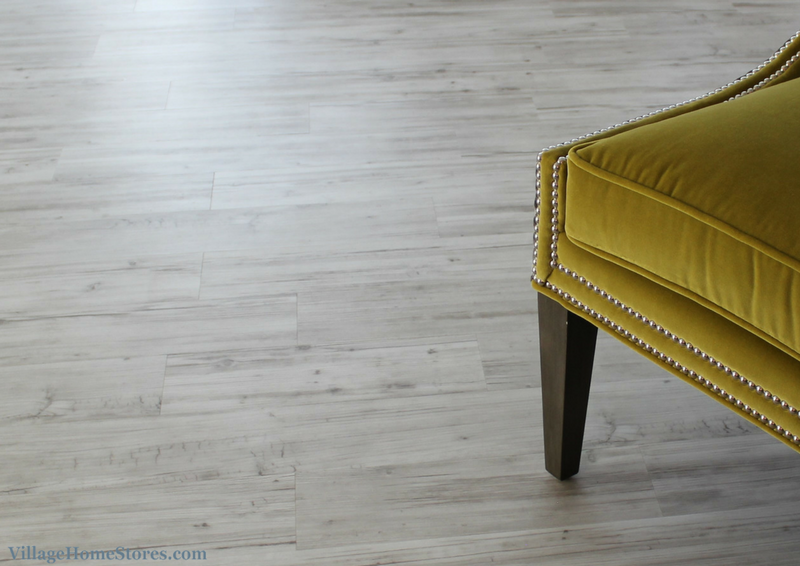 Read more about LVT here in this past blog post. 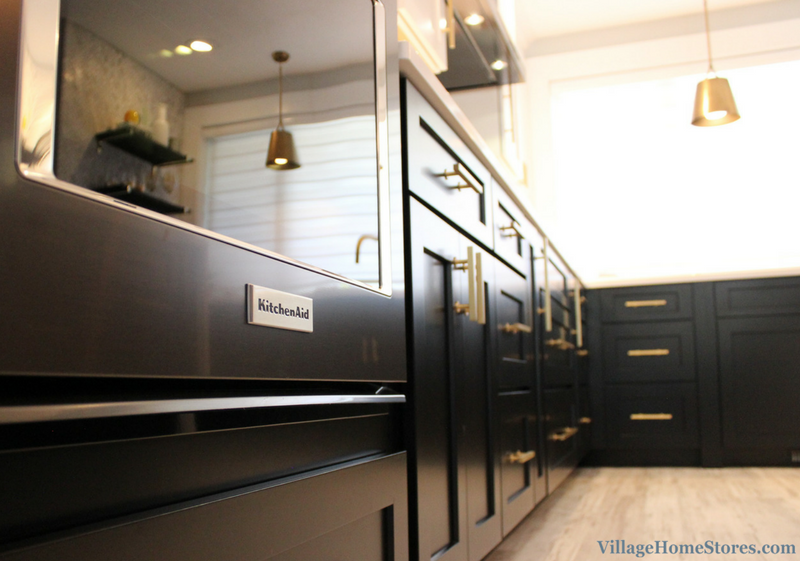 This kitchen is full of wonderful storage! 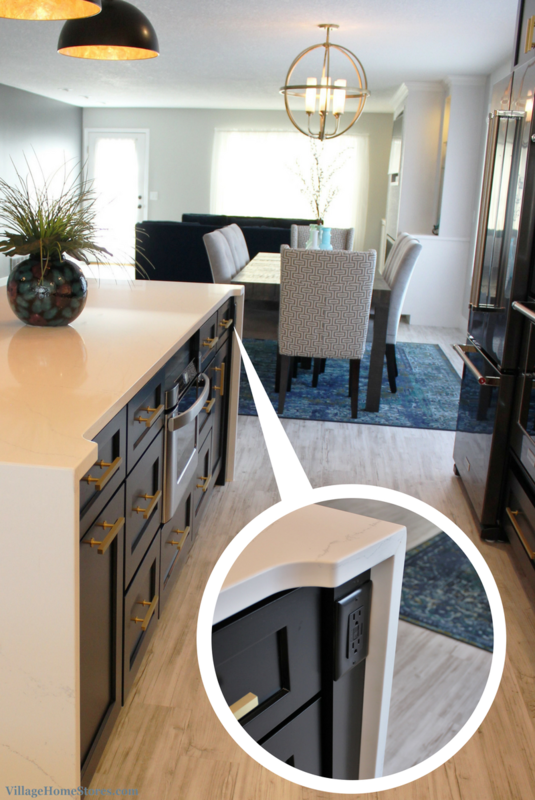 Drawers are full-extension, self-closing drawers and the interiors of the cabinets have been fitted with sliding shelves. 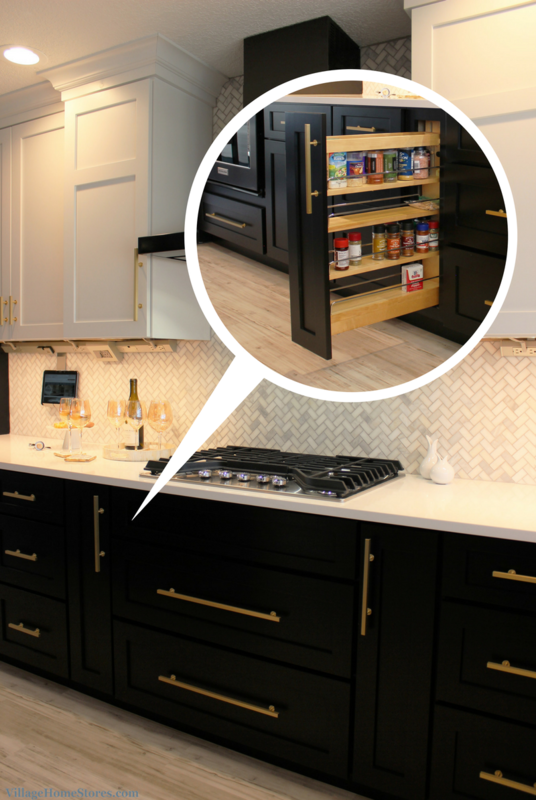 Even the tall pantry cabinet has sliding shelves inside. 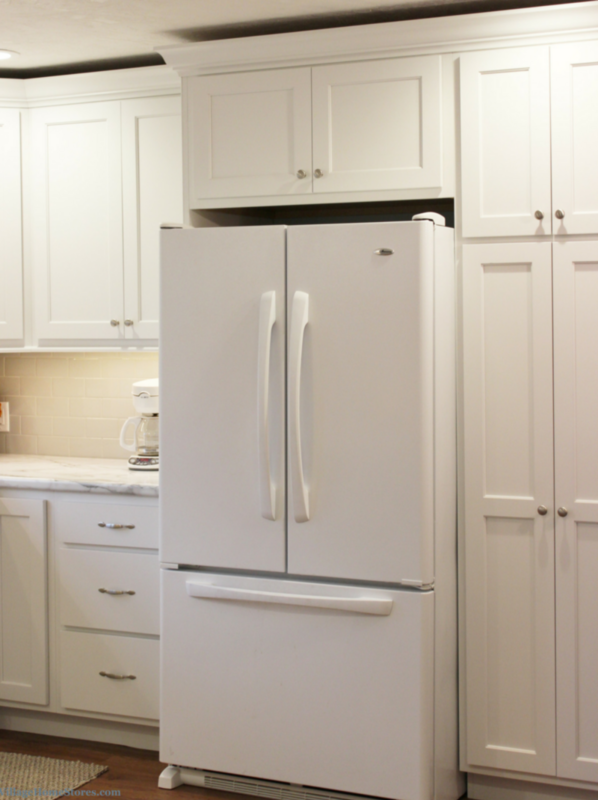 This kitchen doesn’t just have one tall pantry cabinet. 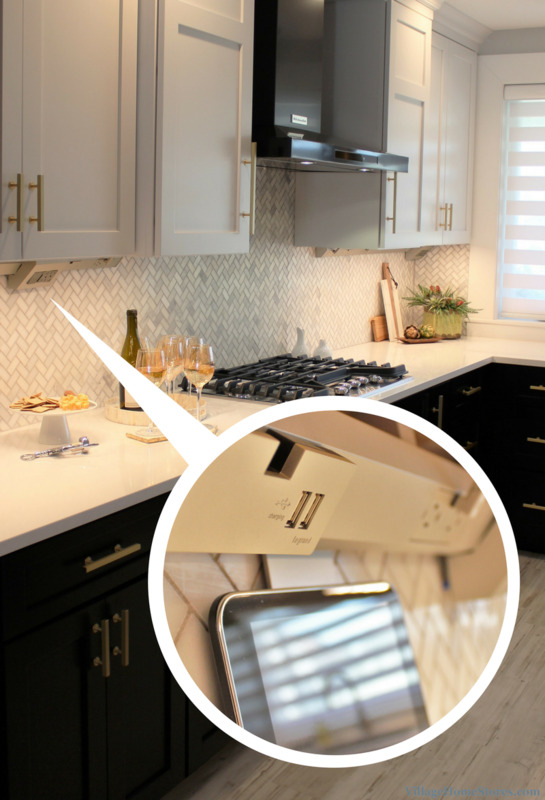 There is another located across the kitchen in the desk area. 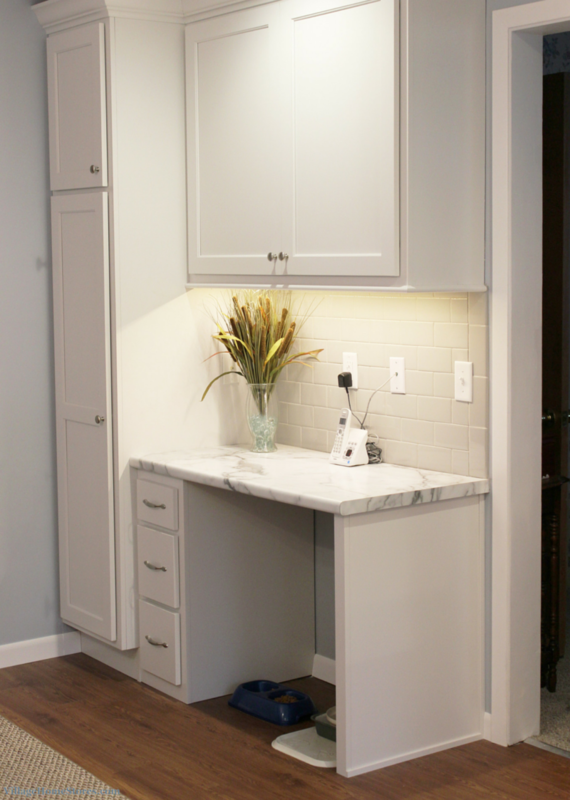 If two pantry cabinets aren’t enough storage there is always the bonus storage found in this large 45″ wide wall cabinet above the desk. 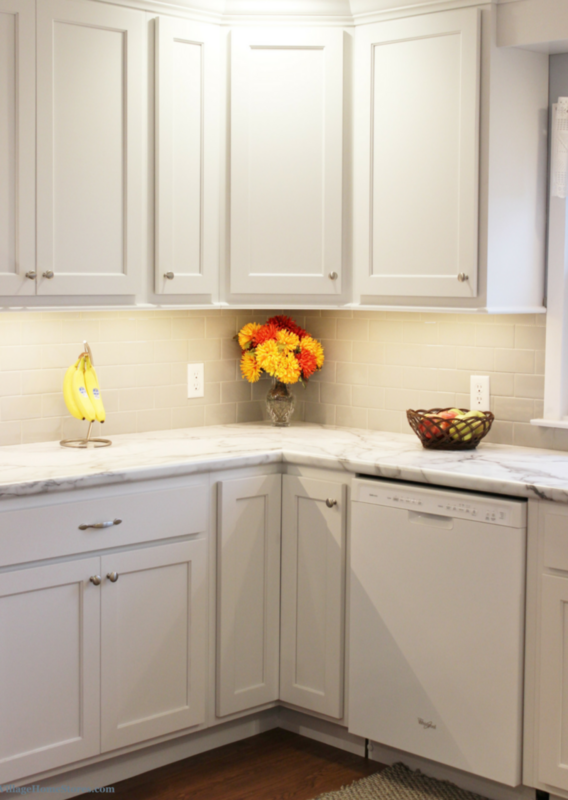 The Formica tops and subway tile backsplash would not look as stunning if it weren’t for the great light that washes over them. 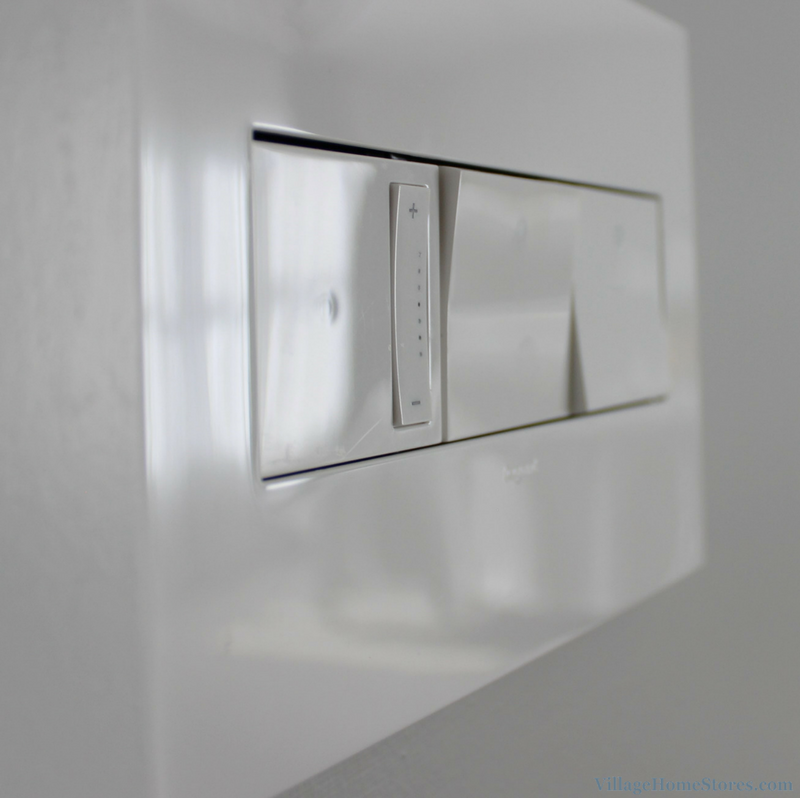 Our Diode L.E.D. 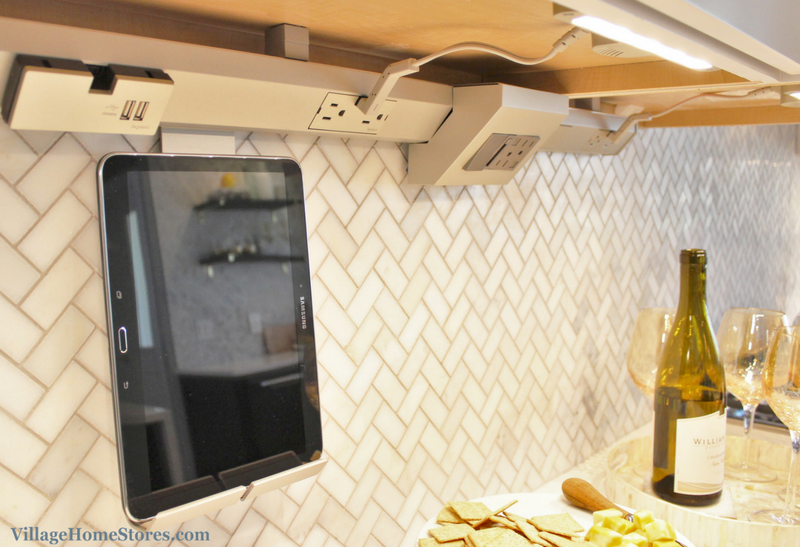 lighting system has been installed here for undercabinet lighting. 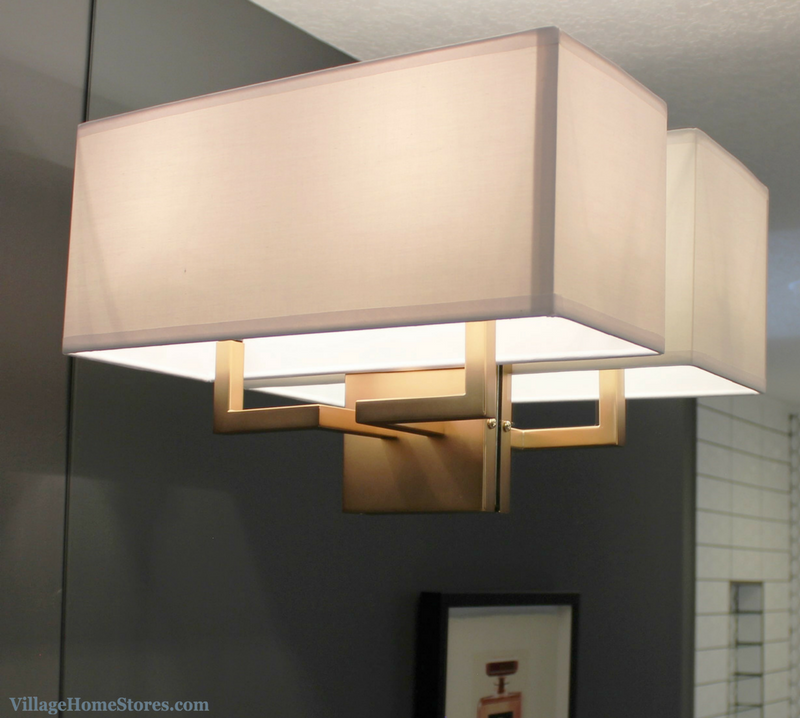 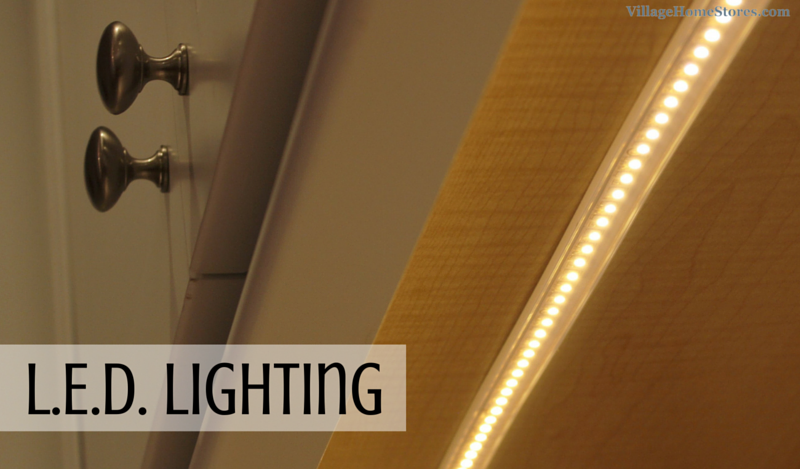 These lights are energy efficient and help any kitchen look amazing day or night. 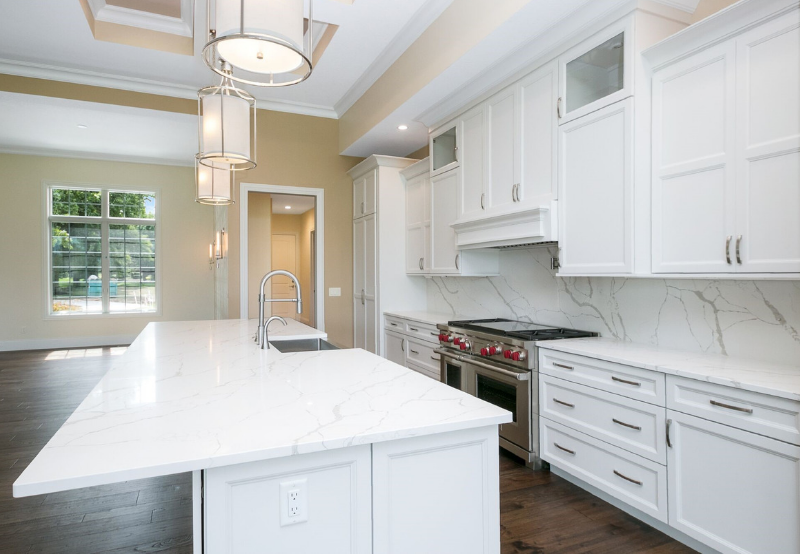 While many older and historic homes may not have this large of a kitchen, we can make any space look just as classic. 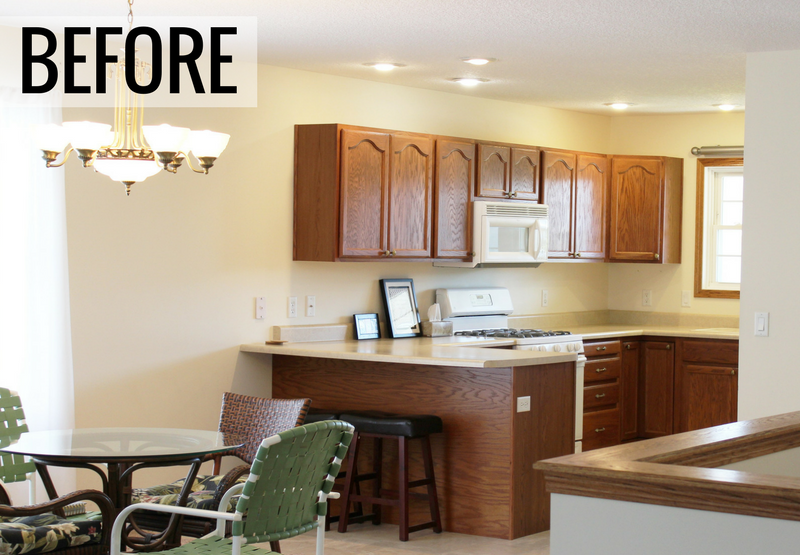 In this case, the home had been remodeled many years ago to create a larger kitchen. 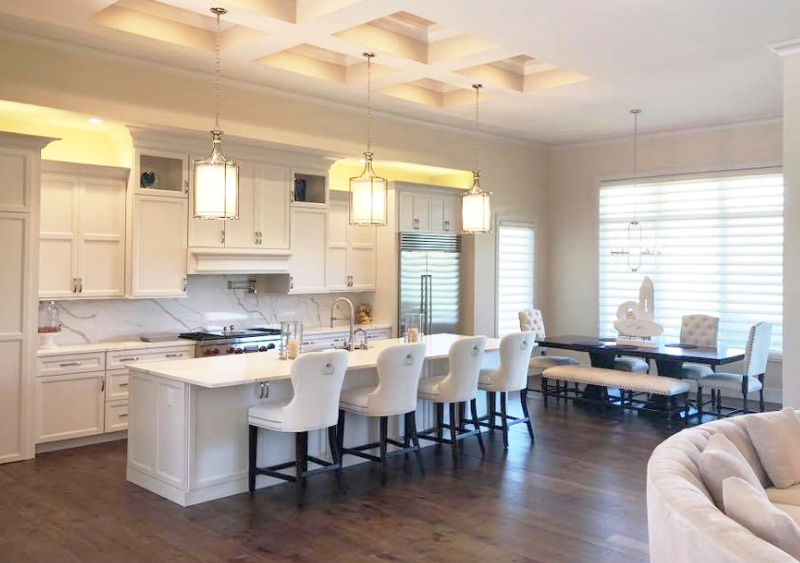 This new U-shaped layout with a built-in desk area and secondary dining space (formal dining room is just outside the door) this kitchen is fantastic and functional. 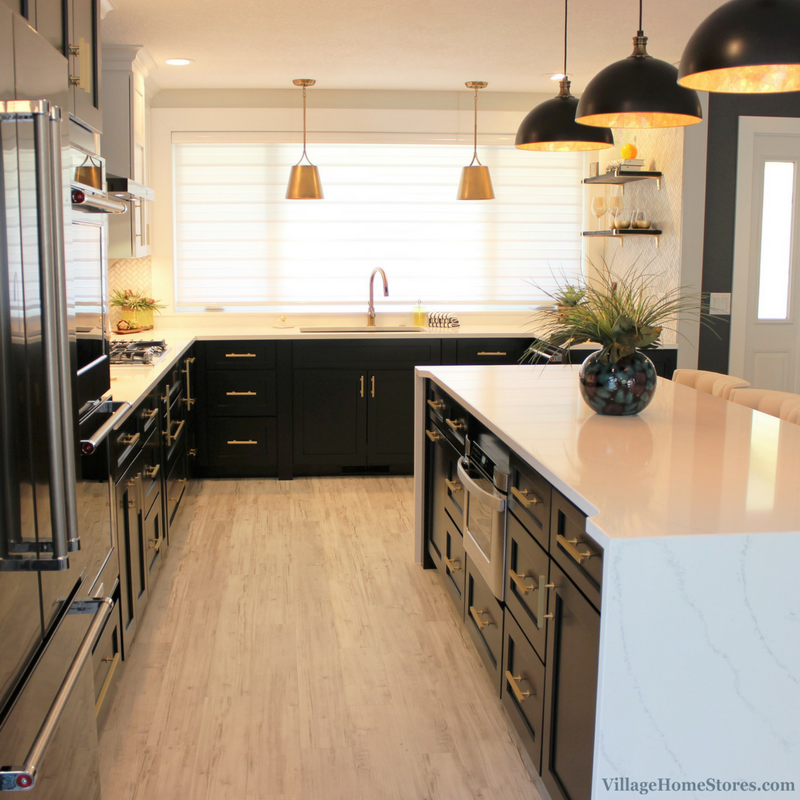 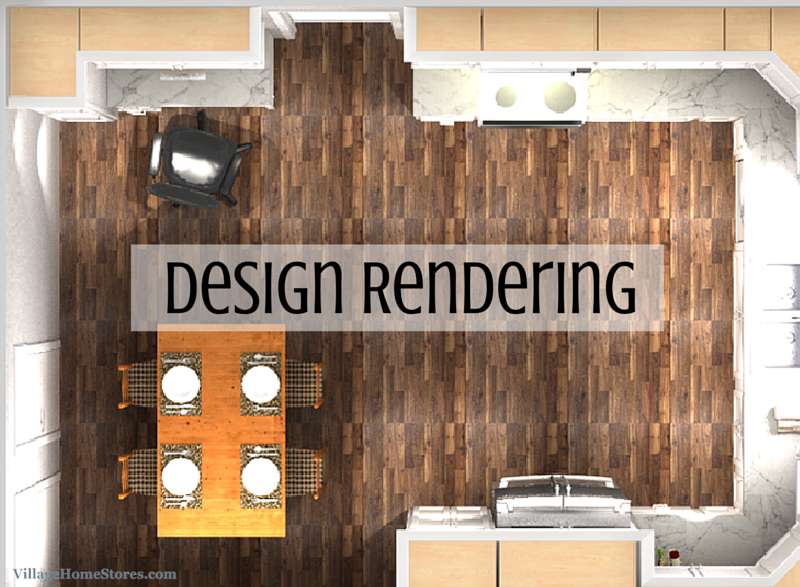 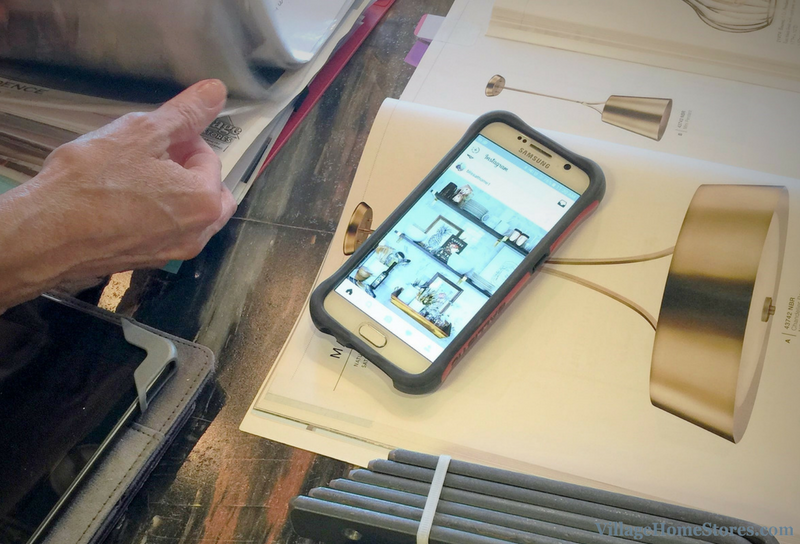 Are you ready to start your kitchen remodel? 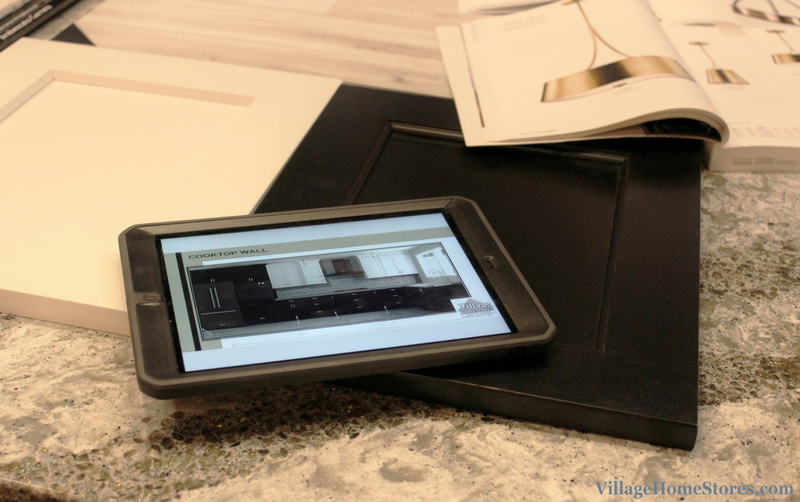 Planning on building a new home soon? 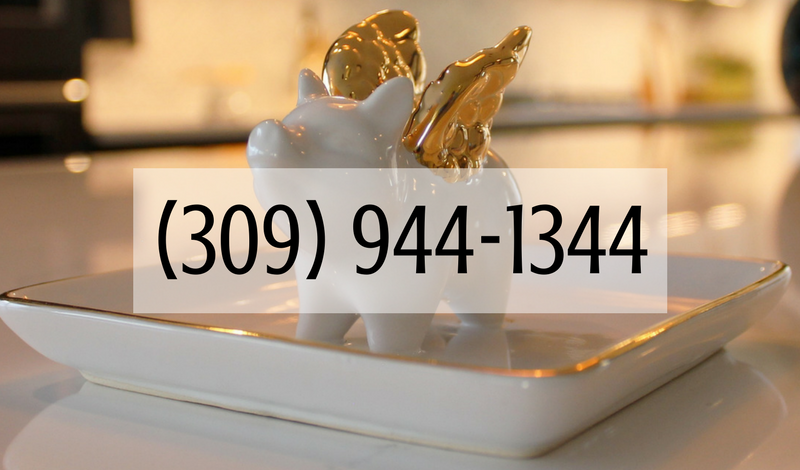 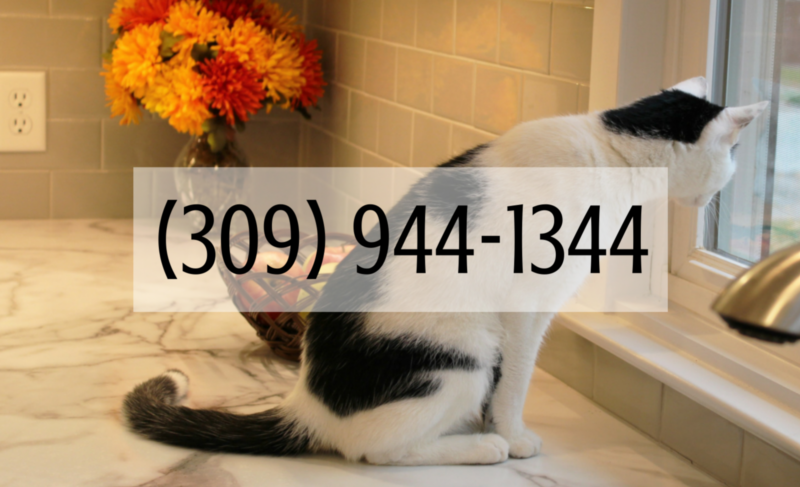 Click here to set up an appointment or call today at (309) 944-1344 to start the process. 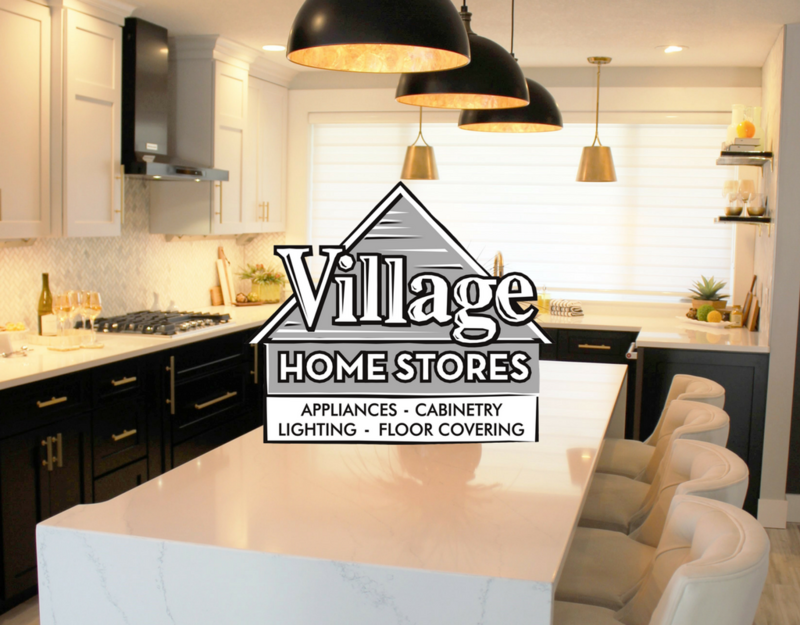 We can’t wait to hear what your dream kitchen looks like!